Sisters Laura Condlln and Nicole Power. Photo: Cylla von Tiedemann. Edith Wharton typically used her pithy prose to write about her own milieu: The aristocracy. Bunner Sisters, a bleak novella written in 1897 but not published until 1916, is an interesting exception. It relates the story of two sisters trying to keep their heads above water in a shabby neighbourhood in New York City. Teetering between subsistence and real poverty, the sisters do their best to run their small sewing shop with dignity and imbue their difficult lives with a little joy. 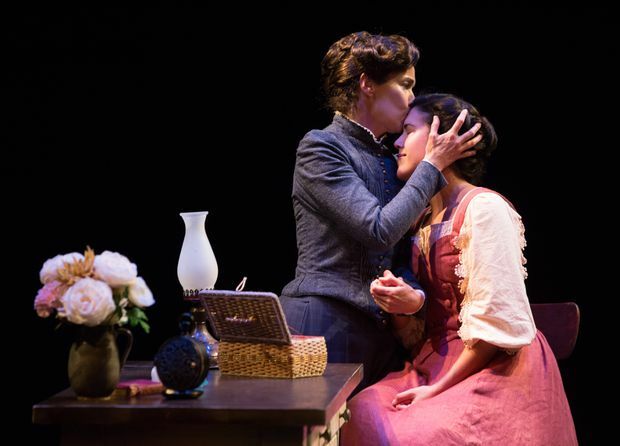 Sisters, a new adaptation of Wharton’s novella, opened at Soulpepper Theatre in Toronto on Wednesday night. It’s easy to imagine why two young Toronto artists – playwright Rosamund Small and director Peter Pasyk – were drawn to this tale of survival and artisanal labour set against socioeconomic uncertainty. Wharton’s world was a time of rising rents, widening income inequality and no social safety net. This was hard enough for men to deal with, but for two lower-class, parentless and unmarried women with next-to-no savings, the outlook was especially grim. Soulpepper gives us a polished, atmospheric production, if something of a bemusing one in its risk-free gentility and reluctance to refract Wharton’s themes through a contemporary lens. There are horrors in this novella that still feel cloaked in polite, turn-of-the-20th-century prose. Still, Pasyk’s direction is graceful and often visually poetic, his talent manifest in several powerful stage images. He’s helped by Michelle Tracey’s spare set, a raked stage in a utilitarian-looking frame, which serves as Ann (Laura Condlln) and Evelina’s (Nicole Power) claustrophobic shop. The sisters’ lives are changed by the arrival of a German clockmaker, Herman Ramy (Kevin Bundy), who sells Ann a small clock. Ramy’s lodgings are creatively designed: They exist above the raked platform in a compartment that opens and closes like a peep show. The disreputable implications in that effect come to fruition as the plot unfolds. Pasyk advances the narrative through elegant staging and moments of vivid symbolism. Ann’s fears and desires are vivified in sequences that transpire like semi-conscious dreams, accented with the bold use of blackouts and sharp sounds (designed by Richard Feren). Dust falls from the ceiling when the sisters’ neighbour, Mrs. Mellins (Karen Robinson), has a headache upstairs; the rain starts and stops with theatrical abruptness. Although the sisters are nestled away in their basement, there’s a sense that the membrane between inside and outside is so thin it might be illusory. The dangers associated with poverty – illness, depression, isolation, addiction – encroach from all sides. Wharton’s novella is Ann’s story; its climactic incident is a dramatic act of self-sacrifice that she believes to be for her sister’s benefit. The horrific fallout of this act forces her to realize “that to refuse the gifts of life does not ensure their transmission to those for whom they have been surrendered.” In this way, Wharton draws an analogy between a poverty of means and a poverty of the soul – namely, the inability to submit deeply to life’s pleasures. With that comes a subtle condemnation of deprivation as a moral act and, concomitantly, of some basic tenets of Christianity. These ideas about the ethical relationship between your own happiness and the happiness of others aren’t felt in Small’s script. Yet, my chief difficulty with her adaptation isn’t its departure from the original, but its surprising modesty in reworking it. She and Pasyk have thrown the bulk of their attention into the theme of time; it’s the appearance of the clockmaker, and Ann’s gifting of a clock to Evelina, that sets the ill-fated plot in motion. Time is money in an increasingly industrialized world; it also symbolizes a woman’s declining value as a bride and shop clerk or – less euphemistically – as an actual human being. There’s some accordingly funny writing on the topic of women and aging: When Evelina feels threatened by a café waitress, she boasts that she’s been told she looks too young to waitress herself. Pasyk also makes the theme omnipresent with the ongoing refrain of a ticking clock under the action or as scenes transition. But the notion of women being tantamount to expiring commodities bursts with a contemporary relevance that doesn’t seem to get its creative due here. Ann’s loneliness and desperation feel glossed over in the interest of getting through the plot. Small approaches this desperation with more lightness than exists in the novella, and tacks on an oddly optimistic ending: Ann declares her continued commitment to life’s beauty. Yet Ann’s pious disavowal of beauty has actually catalyzed the entire plot—the ending adds to a general sense of thematic muddle. Power is compelling as the self-absorbed younger sister who speaks passionately about music and nature. Condlln has a harder job giving Ann convincing depth, partly due to the character’s inconsistencies in the script. Maybe Small’s play would find profundity and focus with a little more development. But my ultimate perplexment with this production is how much it feels like a 19th-century adaptation of a 19th-century story. The themes of women, powerlessness, destitution and drug abuse are so relevant today – it’s surprising to see a young creative team approach them with a sense of propriety and historical distance instead of tackling them with the grit and gruesomeness that Wharton hints at. Sisters continues at the Young Centre for the Performing Arts until Sept. 16.